Budget Beauty : Where to buy. With so many beauty blogs existing in the blogsphere, we all tend to have a ever growing wishlist of products or brands we would like to try. On occasion though, our bank balance doesn't allow this, so we will go without. Save for it or maybe even pop it on a birthday list. 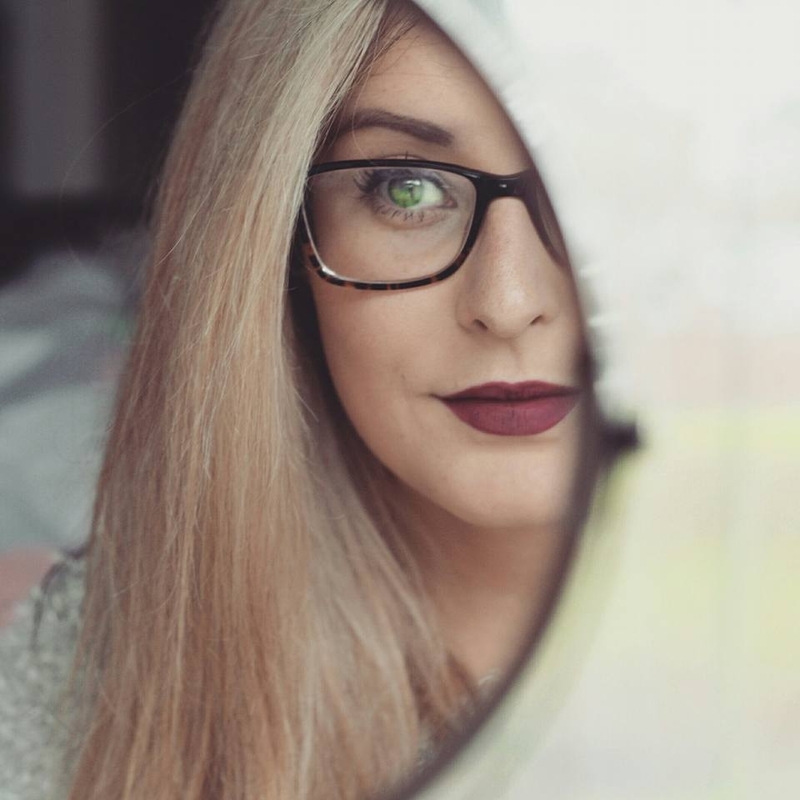 Having said that, there are a couple of places you can look online for specific beauty discounts, I'm always having a look on these sites so I thought it was fair to share my thoughts on them. Now I will admit, it is a bit hit and miss with the ASOS Beauty sale, however pair the savings you make with a discount code and you could be on to a winner. There currently isn't too much on offer in their up to 35% off sale, however I did manage to pick out some bits. If you like a tan, there are a few fake bake products discounted along with this Instant tan from Xen Tan. I find sales like this are a great time to think ahead and plan for birthdays or maybe even Christmas. Gift sets like this one from Fake bake would be a fab set to give someone who likes to stay bronzed all year around! ASOS always seems to have various nail polishes from OPI, Nails Inc and Models Own in their sale, so it's worth having a look to see if they have any shades you are lusting after, or ones you have struggled to get your hands on. I find Fragrance Direct is the Tkmaxx of the online Beauty shopping. You have to rummage a bit to find some good deals. Which is slightly annoying, but if you persist & have the time to spare you could come across some really good deals. You can get a few 'drugstore' bits on there for cheaper than you would in Boots or Superdrug. This Revlon cream blush is down to £3.99 & the Max Factor Mascara has a huge £7 saving on it. I find that Fragrance Direct is a good site to get some decent skincare deals, I was surprised to see a few products from the Body shop on there along with the popular brand Elemis - There's quite a lot on offer. Well worth the time spent searching in my opinion. All Beauty (formerly Cheap Smells) is my go to website if I want to get hair products and perfumes. They have some amazing savings on particular brands. The Macadamia Oil brand has a lot of fantastic deals including the Healing oil spray which is down to £9.49 instead of £23.50. There also a lot of TIGI products on the site at really good discounted prices so they are worth a look. Along with the more high end perfumes, I love to have a look on All Beauty for the cheaper - dear I say it Celebrity perfumes because you can get them for a pretty decent price. I'll admit I like the Britney Spears Fantasy perfume & if i can save myself £23 when purchasing it, then why wouldn't I pop it in my online basket? It's definitely a site you want to check out if you are thinking about getting a new scent or want to treat hair to a bit of TLC. There are also the more obvious places like checkout out department store sales, I know House of Fraser currently have a sale on, along with Debenhams. Beauty Bay and Feel Unique are also hosting sales at the moment. 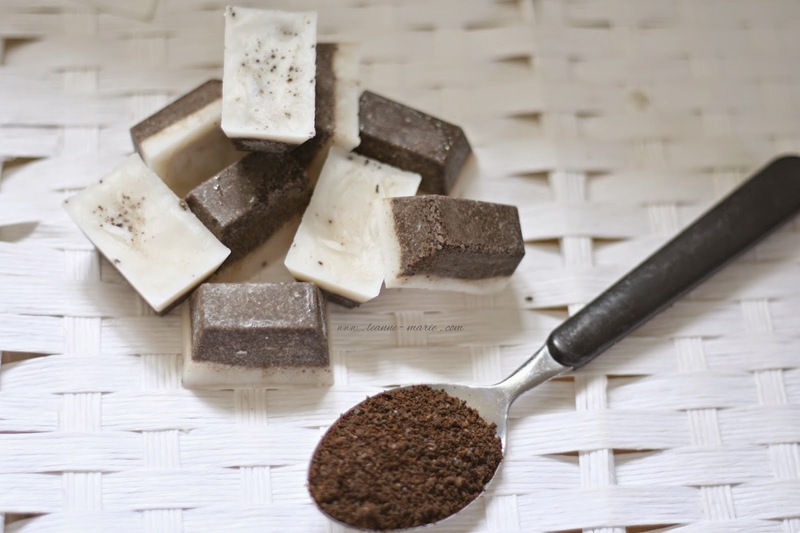 Budget Beauty : DIY Coffee & Coconut Body Scrub. I wanted to feature a DIY during my budget beauty series, and as the franks coffee scrub seems to be making its rounds in the blogsphere I thought it would be rather apt to share with you a cheaper DIY alternative. So why are coffee scrubs so good for you? Well a main reason why people like to use coffee in their beauty regime is because it helps with cellulite.The caffine in ground coffee helps stimulate the toxins that cause cellulite under our skin. It has the effect of dialating blood vessels which in turn tones and tightens. So by using coffee in a scrub and introducing it into our regular beauty regime, it helps remove that build up. Your cellulite wont vanish completely straight away but you will see an improvement. There are many variations of scrub recipes online, I went for the most simple and cheap option using just two ingredients. Ground coffee & Coconut oil. If I had a bit of vanilla essence I would have thrown that in for a yummy scented scrub, however as we are midway through packing to move I couldn't locate it. To create 10 ice cube sized scrubs you will need to use..
3 table spoons of Ground Coffee. Mix 3 parts Coconut oil with the coffee and add it to your use cube tray. Using the remainder of the oil, top up each cube so you end up with a layer of coconut oil on the top/bottom. Place the tray in the freezer for an hour or so... the mixture will set and you will be able to use it!! It is probably best to keep the scrub cubes in the freezer until you need to use them. Just take one with you into the bath/shower. Warm it up between your palms, or under warm running water. Then proceed to use the scrub on your desired areas! If you would prefer not to use them in cube form you can always use the mixture straight after you mix it all together. A little less convenient but works just as well. Will you be trying out this DIY? Budget Beauty : Primark Mini Manicure set. I cannot tell you the amount of times I have been out and about, broken a nail and had nothing with me to sort it, this happens a lot at work or on holiday. I also tend to forget to pack tweezers with me when I go away which not only means I cannot tame my eyebrows, it effects my false eyelash application too! Tweezers really do aid the application of false lashes! When I saw this adorable little manicure set in Primark for a mere £2 I just had to purchase it. Firstly LOOK at the chevron print. So pretty. They did have other floral designs but this one grabbed my attention, and I felt would go with more things as I am not THAT big into florals. The case is rather sturdy and fastens with a clasp, I would say if you are heading to primark to get one of these do test the clasp out before you buy AND check all the items are inside, yes there were some without the tools in them! Inside you get the standard items, some nail scissors & clippers.Tweezers, They aren't the sharpest, but will do in an emergency! A nail file & a cuticle pusher. This may not be a necessity as we probably all have these items separately in our beauty stash anyway, however I think its a handy little set to buy for only a couple of quid. Keep it in your bag, take it with you on holiday. Leave it in your desk at work. It's just nice to know that if you need it, it's there. Postage is £3.00 & will be sent 2nd Class. - I can only post on Saturdays. Leave a comment if you want something, plus your paypal address. CK single Shadow - Evolved | Bourjois shadows in #54 Brown, Colour Intense Black & Pink Shimmer £1.50 each. Affordable Fashion : Discounted Kurt Geiger, Carvela & more! Every now and again I’m sure you like to splash out on a nice new pair of shoes, spending that little bit extra for a special occasion. When this sort of situation arises, I often find myself searching a bit further than the usual New Look or Topshop pair, opting for a pricer brand... well they are going to be special occasion shoes! This however in the long run can become rather pricey. I do have a bit of a soft spot for Kurt Geiger, Carvela and MissKG Shoes. There’s such a good variety that you are bound to find something suitable, however the price tag on some pairs does put me off slightly. Imagine my delight when I discovered a website full of discounted shoes from these brands and more! Shoeaholics.com is operated by Kurt Geiger, providing shoppers with the much coveted brands but at a lower discounted price. Winner Winner. Not only does the site offer heels, trainers, boots and flats at a discounted rate. There’s also the odd extra accessory like Sunglasses, purses, handbags and even the odd bit of jewellery. The site is well worth a browse if you fancy treating yourself without the guilt. Now don’t get me wrong, I understand that some of the prices on the site may still be a little more than you would regularly spend on one pair of shoes, but if you look at the original price you know you are getting a saving for a good quality pair of shoes . Lets be honest they will probably last a lot longer than the £15 pair of heels you picked up in Primark. When i have logged onto the site in the past you get a pop up asking you to join their mailing list, if you do so you can get a 10% off code to use on your order. Making even more of a saving. Currently all shoes are £39 or less. With some pairs totaling over £100 RRP this is such a good deal. Obviously stock is limited and you may not be able to get the shoes you want in your size, however do browse the site because there are SO MANY STYLES available! A leave in conditioning treatment has and will always be a staple in my haircare routine. I’ve dabbled with a few variations in the past most recently the Redken All Soft supple touch spray – Gosh that’s a mouthful. This particular spray acts like a leave in conditioner/treatment, detangler as well as helping keep my hair feeling very nourished and soft after washing. At £12.95 it isn’t the most expensive hair treatment out there but I was sure I could hunt down another product similar that you wouldn’t have to purchase online or in a salon.. This is where we welcome the Dove hair nourishing oil care leave in spray. Retailing at £3.59 it’s a lot easier on your purse for a start, as well as being easily available from your local Boots or Superdrug. 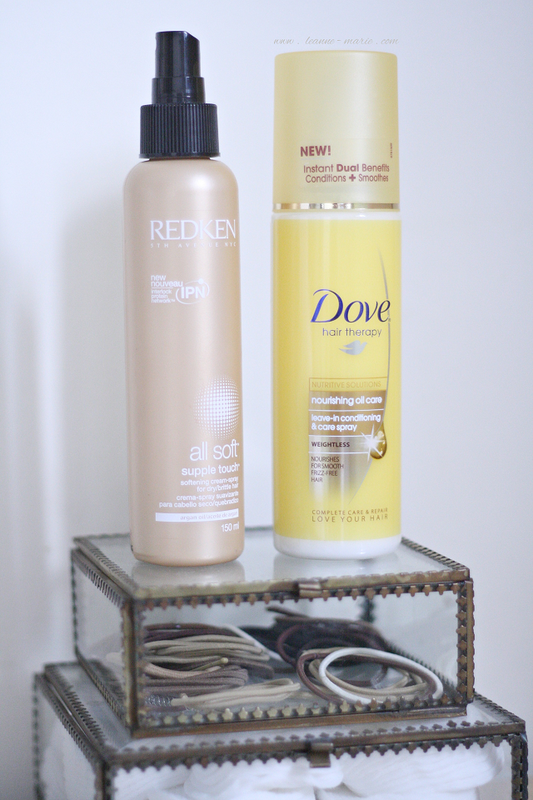 Just like the Redken version, the more budget friendly Dove leave in Spray not only helps detangle your hair after washing (Now I have gone a bit blonder I struggle with the tangles more often!) but both contain Argan oil to provide your locks with nourishment and shine, therefore my hair feels extremely soft and in better condition after continued use. Both are very lightweight in consistency, so you do not have to worry too much about product build up weighing your hair down. In fact I would say, that you can be pretty liberal with the application of the Dove leave in spray on both wet and dry hair. Yes that's correct you can use the Dove spray straight after washing on damp hair, or alternatively use it on a 'no wash' day to liven up and refresh your locks, keeping your frizz at bay. As you can 'top up' your hair using this spray it is a great product to take with you away on holiday. Being out in the sun all day, in and out of the sea or pool your hair is gong to become a bit dry and malnourished, keep this handy little spray in your beach bag (or decant some into something like this from muji) so you can continue to use it as you sunbathe! As it is cheaper than the Redken version I wouldn't mind taking it away with me, I don't like to take any pricer products with me on holiday as I have a habit of forgetting them & leaving them in hotel rooms! Have you tried this budget friendly leave in conditioning spray? Affordable Fashion : Supermarket Sweep! 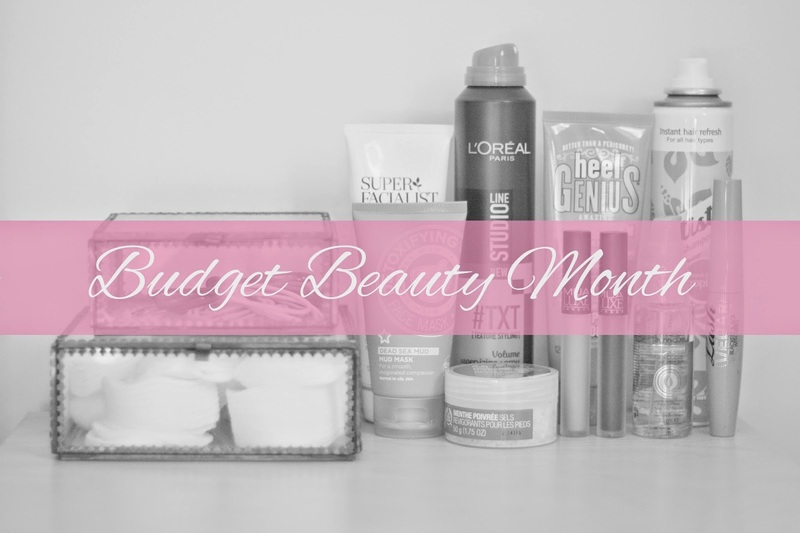 Along with affordable/Budget beauty, I thought I would carry on the theme with a few fashion posts aswell this month. Let’s be honest we all love a bit of clothes shopping, even more so when we don’t have to spend too much or there’s deals to be had! Recently I feel that the supermarket brands have really stepped up their game in regards to producing some nice pieces to add into your wardrobe, especially items that would be perfect for your holiday. With my trip to Egypt getting ever so close I thought I would do a little bit of window shopping & see what fab bits I could find from the two main supermarkets I go to. George at Asda has some really good pieces available at the moment. A few bits have gone into the sale so it's a great time to pick up a couple of new dresses or playsuits for your holiday! Usually when I go away I do pack a lot of dresses, mainly because they are the easiest item to just throw on and go! I do like the looser fit styles like this Tshirt dress... You know just incase I spend a little too long in the sun and get a bit burnt! The heart print pumps are just adorable. I tend to not worry too much on purchasing expensive footwear when I go on holiday. We like to go exploring so chances are i'll fall into a rock pool or something at one point! So when it comes to footwear 'Throwaway fashion' is where it is at, £6 for these cute shoes, you can't go wrong with. When ever I go on a food shop I always disappear off for a bit to have a browse around the Clothing at Tesco section. They've really upped their game with more on trend pieces that would be a welcome addition to my wardrobe. I find that if you want brights then Tesco is the place to go. It's always nice to add a treat to your basket as well as the regular monthly shop! 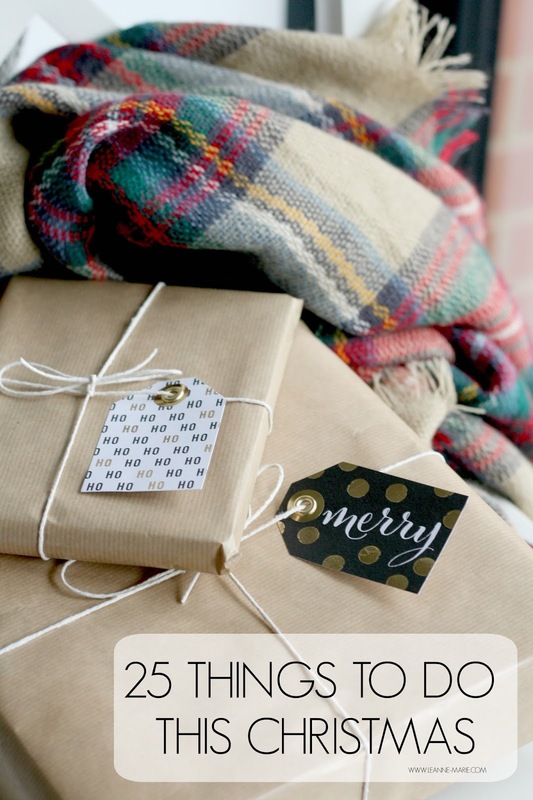 They have such a variety of items perfect for holidays! JUST LOOK AT THAT CAMI, it screams perfection - However will possibly clash if you are one to burn not tan. I really like the multicoloured tunic, it also comes in two variations of top's so would be a nice pop of colour to add into your workwear wardrobe too! Now is a really good time to go hunting for some last min summer bits. Some stores have already started getting their A/W stock in, so the likely hood of items more suitable for warmer climates being in the sale is high, making them even cheaper! Win win! Do you like to throw in a bit of clothes shopping while picking up your weekly food shop? There's always a lot of hype around detoxing face masks but as I was never really much of a face mask girl (I know slap my wrist) I didn't want to shell out a lot of money on a tube and not get on with it. Strolling through the aisles of Superdrug I came across this Dead sea mud mask for a mere £2.59 (also available in sachet form for 99p) with its affordable price tag I figured it would be worth a purchase to give it a go. I don't often get breakouts, but I had noticed my skin appeared a bit congested around my chin area. With Dead Sea mud containing many beneficial minerals to improve your skin I thought it may be able to help out with this little problem I was having. The rich mineral content speeds up natural exfoliation and restores your skins PH balance. It's not really a quick fix but with continued use it is meant to help improve your skins condition. For ease of application I apply the mask using a Real Techniques foundation brush from the Core Collection. This ensures that I don't waste any product, and I don't have it all over my hands! I apply it all over my face but focus mainly on my T Zone area. Especially my chin where the issues were. There's a slight lavender scent to the mask which surprisingly I don't mind, which is amazing as I really dislike the scent of lavender! Once on your face you do feel a slight tingling sensation as it dries, which for some may be a bit irritating, but you get used to it. As it dries you can see that some areas tend to stay a darker shade of khaki, this mainly occured on my chin and nose where the mask was pulling out the impurities from my pores - ooh how lovely. I've been using this mask once a week for about 2 months now and I can honestly say that the amount of crap that gets pulled out of my skin has lessened across that 8 week time period & my chin is less congested. For the price I've been pretty impressed with this little tube of muddy goodness. 2 months in and I still have plenty of the product left, so you get a nice amount for your money. I've alsobeen really happy with the results I've had when using it. It will be a definite repurchase when I use up this tube. 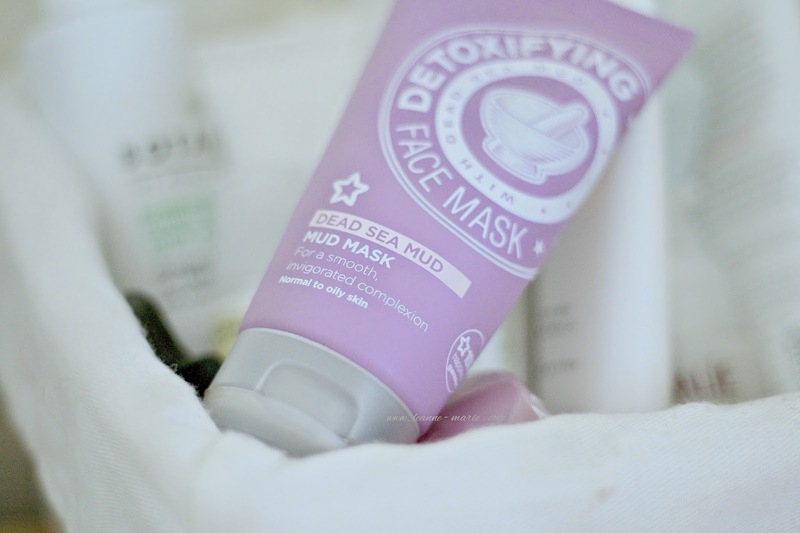 Have you tried this mud mask before? Will you be trying it?